I joined a scheduled tour of a competing tour operator with the idea of scouting Sulawesi and Halmahera before offering tours there ourselves. 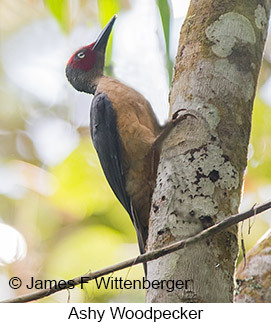 We had great success seeing nearly all possible endemics as well as many other Indonesian species. I traveled with a group of 5 other birders, all with advanced skills and all very amiable and helpful throughout the tour. I arrived in Indonesia two days early (Sep 2), making the flight connections very low stress. I spent my first night in a well-priced hotel with comfortable accommodations not far from the airport in Jakarta. It was helpful staying overnight, as connections between international and domestic flights currently require a change of terminals. I'm told the shuttle bus inside airport premises can take as much as 2 hours between terminal 2 (international arrivals) and terminal 3 (domestic departures on Garuda Indonesia airline). Staying overnight in Jakarta mitigated this possible issue. My transfers from and back to the airport were 15-20 minutes each way. On Sep 3 I took a late morning flight from Jakarta to Makassar, arriving mid-afternoon. I must say that Garuda is a superb airline, and according to Skytrax has the world's best cabin staff among all airlines of the world. My flight to Makassar arrived on schedule, and I stayed the night at Ibis Hotel, located on the airport premises next to the departure gate. There was some noise in my room, though tolerable, but the convenience can't be beat. One can easily walk to the hotel from the arrivals area and walk next morning to the departures terminal. In this case the group met in the hotel lobby late morning of Sep 4. We used 3 Toyota SUV's throughout the tour, so those not in the guide's vehicle missed a number of species seen during transfers. This arrangement resulted in a few species being missed. Accommodations varied from western style hotels to very rustic guesthouses with Indonesian-style squat toilets. 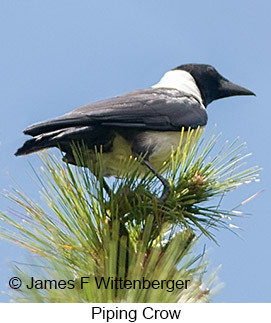 The latter are all that is available near some birding sites. Our daily schedule was physically demanding, generally up very early and out until after dark, with some mid-day breaks as described below. Our group hiked up the Anaso Track twice, a rather difficult uphill hike for those not in very good shape. Some tour groups do not hike far up the track, resulting in a significant number of missed species. Below is a day-by-day account of the tour from my perspective. Sep 4: The day began with a transfer to the fish ponds outside Makassar, stopping for lunch at a roadside restaurant en route. Our driver missed the turn to the fish ponds, and in the process of trying to do a Y-turn on a busy road caused a motorbike going in the opposite direction at somewhat too high a speed to veer off the road and crash. The motorbike driver was scraped up and his motorbike was pretty heavily damaged. This created an uproar, as we were immediately surrounded by bystanders. We had to take the motorbike driver back to his home. Our driver became involved in a big and rather heated discussion about compensation with the family. We didn't actually hit the motorbike, but our Y-turn maneuver did cause him to crash. The Indonesian way is to settle matters among the parties since insurance is not commonplace and police are nowhere to be found. To not unduly delay us, a family member took over the driving of our vehicle while our driver remained behind to discuss the situation. Our driver rejoined us that evening at the hotel, evidently reaching us via a vehicle loaned out by the victim's family. This was our first exposure to the vast cultural difference between Indonesia and western countries. It wouldn't be our last. We reached the fish ponds at 3:00pm. Birds there were mostly quite distant, offering mainly scope views. Some migrant shorebirds had already arrived, so we picked up a number of those. Most interesting were brief views of Buff-banded Rail as it flew into a patch of vegetation along the shoreline. After an hour at the ponds, we transferred to Malino for a one-night stay at a hotel in town. We reached the hotel at 6:20pm. Sep 5: We departed at 5:15am for Lompobattang Mountain. Our primary target bird there was Lompobattang Flycatcher, an endangered species with a very small range restricted to that mountain. Getting into the forest requires a half hour's gradual uphill hike through cultivated fields, which we did partly in the dark. We had very distant silhouette views of Piping Crow along the way. It wasn't long before we found a Lompobattang Flycatcher singing directly overhead in response to playback. We had excellent views from below. This species is not always so easily found, and we picked it up at lower elevation than is typical. We soon picked up other interesting species. We had good looks of Sulphur-bellied Whistler and Citrine Canary-Flycatcher along with brief views of Mountain White-eye and superb views of Sulawesi Leaf Warbler and Black-ringed White-eye. We continued up the trail and had brief looks at Rusty-bellied Fantail flitting around in mid-story and a very brief look at Mountain Tailorbird as it flew overhead. 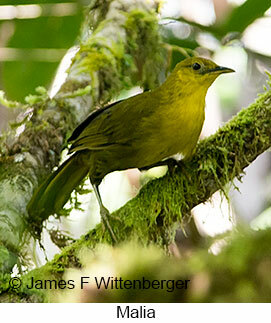 We also had a very brief but good look of the endemic Dark-eared Myza, also called Lesser Sulawesi Honeyeater. We stopped for a box lunch just below the spot where the trail becomes much steeper and rockier. There we saw an immature Red Junglefowl. On the way back down the trail we had much better views of Rufous-bellied Fantail. We also had good looks at a female and juvenile Snowy-browed Flycatcher and prolonged very good looks at the strikingly plumaged Piping Crow, the latter endemic to Sulawesi. We arrived back at the hotel at 1:00pm. In the afternoon we left the hotel at 3:00pm for the drive back to Makassar. En route we stopped at some rice fields where we had distant scope views of Blue-tailed Bee-eater and Chestnut Munia. A bit farther down the road we stopped at a lake where we had scope views of Sunda Teal and good looks of Golden-bellied Gerygone overhead. We finally reached the hotel at 7:10pm, the first of many long days during the tour. Sep 6: At 5:00am we departed for a small remnant forest outside Makassar near Bantimurung. We spent an hour birding there beginning at 5:30, where we found numerous Gray-rumped Treeswifts and had good looks at Sulawesi Streaked Flycatcher in the forest canopy. We then drove a half hour to Karaenta Forest, a limestone karst forest reserve. There we had good views of Sulawesi Hornbill, Hair-crested Drongo (a possible future split into Sulawesi Spangled Drongo), Black-ringed White-eye, and Sulawesi Myna. Some people also had brief views of Pale-blue Monarch. From there we drove to a lowlands area looking for raptors with no success. We did have scope views of White-shouldered Triller and some widely distributed species such as Javan Pond-Heron. We reached the airport at 11:30, had lunch, and took an afternoon flight to Palu. After arrival there we had a 3-hour drive to the Sendy Guesthouse, a quite rustic place with only spartan facilities. Sep 7: We left the hotel at 3:45am for the Anaso track, arriving at the trailhead by 4:15am. After a box breakfast, we began the long hike up the track in the dark. The track is an old 4-wheel-drive logging road now mostly not used except by occasional people on dirt bikes. The first section of the track up to a major landslide area is quite steep. We walked it in the dark, reaching the landslide shortly before first light. We saw a Diabolical Nightjar by spotlight flying overhead. We also spotlighted a Cinnabar Boobook that responded to playback. Near the landslide we had good looks at Red-eared Fruit-Dove and after dawn a roosting Diabolical Nightjar. Continuing up the track we saw Golden-mantled Racquet-tails flying overhead, had distant views of a female Sulawesi Myzomela, good scope views of Sultan's Cuckoo-Dove, scope views of a Purple-throated Bee-eater in the fog, brief views of Dark-eared Myza, and brief looks at Hylocitrea, one of our main target birds. We walked an upper section of the trail several times looking for Geomalia, a very secretive thrush. We didn't see it. We baited the trail with rice, which apparently benefited a Birdquest group the next day as a couple of participants and the guide in their group saw it along the same stretch of trail. Along that stretch of trail we did have good looks of Sombre Pigeon, found deep in forest understory and typically very difficult to find, along with Red-eared Fruit-Dove, Rufous-bellied Fantail, Mountain Tailorbird, and Sulawesi Leaf Warbler. We ferreted out a Chestnut-backed Bush Warbler for brief but good looks. We also had brief views of Superb Fruit-Dove and distant views of Fiery-browed Myna. We reached the crest of the trail at 3:15pm, an 800m elevation gain from the start. On the way back down we spotted a soaring Black Eagle, had much better views of Purple-bearded Bee-eater, had decent scope views of Blue-fronted Flycatcher, and partial views of several Malia flying about deep in the forest. On the way back to the guesthouse we had distant scope views of a Sulawesi Masked-Owl near Wuasa Village. We reached the guesthouse at 6:50pm after a long day in the field. Sep 8: We began birding around the entrance to Lake Tambing at 5:15am. There we picked up Yellow-billed Myna, Cerulean Cuckooshrike, and Fiery-browed Myna. We tried for Great Shortwing along a trail off the access road with no luck. We then birded a different trail and tried again for the shortwing with no luck. We did see Sulphur-bellied Whistler and Chestnut-backed Bush Warbler. At 10:00am we reached the lake area where we ate breakfast and birded open areas around the park headquarters. There we had good scope views of Yellow-and-green Lorikeet and Finch-billed Myna. We had stunning views of Turquoise Flycatcher and had prolonged good views of Sulawesi Woodpecker and Yellow-sided Flycatcher. On the way back to the guesthouse for lunch we found Ivory-backed Woodswallows perched in a tree along the road. 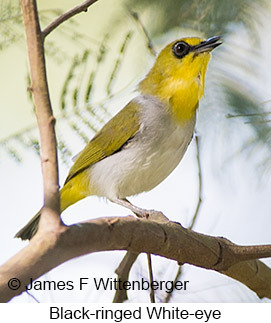 In the gardens at the guesthouse we found Lemon-bellied White-eye and Gray-sided Flowerpecker. In early afternoon we visited Sedoa Valley where we birded the roadside. There we had very distant scope views of Knobbed Hornbill and had good looks of Sulawesi Blue-Flycatcher, Crimson Sunbird, and Crimson-crowned Flowerpecker. In late afternoon we tried again for Great Shortwing back at a trail near Lake Tambing and finally found one for distant views as it came out in the open below us in a ravine. It was so dark by then that we mainly just saw it as a dark silhouette. We reached the guesthouse about 6:35pm. Sep 9: We departed for the Anaso Track at 3:45am, ate a box breakfast in the dark after reaching the track at 4:15am, and started up the track in the dark at 4:40am. The group hiked up the track in the dark faster than I could keep up and found a Speckled Boobook, which flew off before I could catch up and see it. We tried hard for Scaly Kingfisher, which we heard but only the guide saw. We saw many of the same birds seen two days earlier on the way up the track. Some people saw Mountain Serins perched, but I only saw them flying. We tried hard again for Geomalia but again failed to see it. 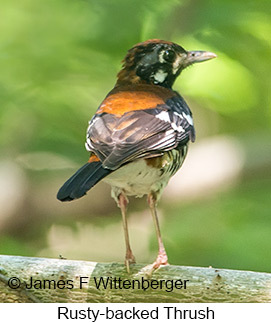 We did have very good looks at Sulawesi Thrush. Some people saw a juvenile Sulawesi Hawk-Eagle flying low along a ridgeline before disappearing from view. On the way back down the trail we had good views of Pygmy Cuckooshrike and better looks at Malias. We then drove back down the road to Wuasa Village to look for soaring raptors. There we had distant views of Purple Needletails in flight, good looks at a Barred Rail, scope views of perched Short-tailed Starling, excellent views of Spotted Kestrel perched on a wire, and distant views of soaring Black Eagle and Sulawesi Hawk-Eagle. At 4:15 we took a gravel road off the main road in the Selibu Valley, which we walked from the point where a washed out bridge was being repaired. We had very distant scope views of Sulawesi Hanging-Parrot and Sulawesi Crested Myna along with good scope views of Sulawesi Cicadabird. We were back to the guesthouse at 6:00pm. Sep 10: Once again we departed early, this time at 4:15am. We started up the Anaso Track at 5:05am after box breakfast and reached the area below the landslide by 5:40am. There we finally had stellar views of a stunning Scaly Kingfisher after considerable effort. On the way back down the track we good though brief views of male, female, and young Tonkean Macaques. Some people had brief views of Sulawesi Babbler. We all had better looks at Malia in the canopy along the road near the trailhead. We also saw Sultan's Cuckoo-Dove and Cerulean Cuckooshrike along the road. We drove back to the Sedoa Valley near Wuasa Village and spent an hour looking for raptors. 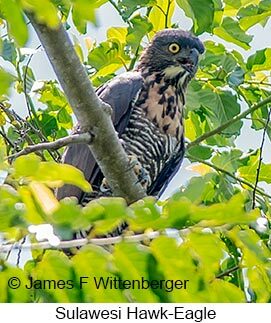 There we had good looks at a perched Sulawesi Serpent-Eagle. We then drove to Lore Lindu National Park where we spent a couple hours birding along the road. The most notable birds seen there were Rusty-breasted (Brush) Cuckoo, Sulawesi Woodpecker, and Sulawesi Myzomela. We were back at the guesthouse by 11:00am for early lunch and some much needed rest. At 3:00pm we went to the Oloboju River where we went searching for buttonquail. We flushed several Savanna Nightjars that were roosting in the dry scrub and grass. We managed to flush both Red-backed Buttonquail and Barred Buttonquail, both mainly seen in flight. Other birds seen included Black-billed Koel, Blue-tailed Bee-eater, White-shouldered Triller, Lemon-bellied White-eye, Plain-throated Sunbird, Olive-backed Sunbird, and with effort good looks at Pale-headed Munia. We were back to the guesthouse about 5:30pm. Sep 11: We left the guesthouse at 5:30am for a drive to the airport and flight back to Makassar. We made our tight connection in Makassar for our flight to Manado. Upon arrival and after lunch, we headed to our hotel in Kotamobagu. En route we stopped at Amurang rice fields where we picked up Zitting Cisticola and Chestnut Munia. We reached the hotel in early evening. Although it was largely a travel day, the easier schedule gave us a chance to rest up for what was to come. Sep 12: We left the hotel at 2:30am for an hour drive to Sinsingon Village and Gunung Ambang National Park. 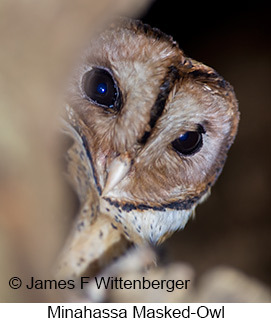 We began hiking up the trail in the dark and soon spotted a Sulawesi Masked-Owl that flew off from the trail. We had an early breakfast at 5:00am in secondary forest and then continued up the trail toward primary forest. The trail has heavy chigger infestations and everyone was affected. 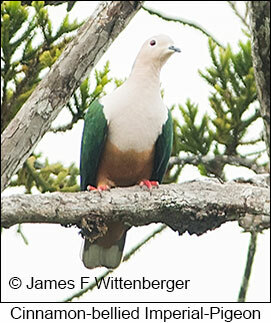 We had excellent views of White-bellied Imperial-Pigeon and Cerulean Cuckooshrike. We found one of our primary target birds, Matinon Flycatcher, which we saw well directly overhead. 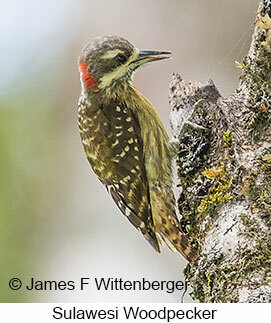 We had good looks of Ashy Woodpecker, Malia, Sulawesi Babbler, and Crimson-crowned Flowerpecker. The guide saw Bay Coucal, which we tried hard to lure into the open but never managed. It stayed hidden in thick foliage. In the cultivated area we picked up soaring Black Eagle and Black Kite, along with Buff-banded Rail, Lesser Coucal, and Chestnut Munia. We spent mid-day back at the hotel. We left the hotel at 3:15pm in a torrential downpour. The rain stopped by 3:40, about when we reached a wetland area. We saw a very distant Channel-billed Cuckoo, a southern migrant to the region. Along a trail into the wetlands we saw Rufous Night-Heron, White-breasted Crake, Eurasian Moorhen, distant Gray-cheeked Pigeon, White-rumped Cuckooshrike, and Black-naped Oriole. 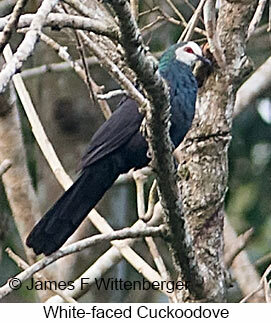 We had superb views of perched White-faced Cuckoo-Dove and good scope views of Black-billed Koel. Some people saw Oriental Hobby, which flew by before disappearing. We all saw White-necked Myna and Finch-billed Myna. We were back at the hotel about 7:00pm. Sep 13: We left for the Tambun Maleo Reserve at 4:00am. At the reserve we walked about 5 min into a clearing where Maleos come down to nest. We found many nest holes where they had laid eggs in the past, but no Maleos appeared. We then walked into the forest, where the guide flushed a single Maleo. Usually flushed birds fly up into the trees, but this one scurried away before anyone else could see it. That was the only Maleo seen this day. Birds we did see that morning included partially obscured views of Maroon-chinned Fruit-Dove, distant scope views of Green Imperial-Pigeon, White-faced Cuckoo-Dove, and Pygmy Hanging-Parrot, plus good looks of Bay Coucal, Sulawesi Hanging-Parrot, Pale-blue Monarch, Yellow-billed Malkoha, and Black Sunbird. We also saw Spotted Harrier, Sulawesi Serpent-Eagle, and Sulawesi Hawk-Eagle in flight. 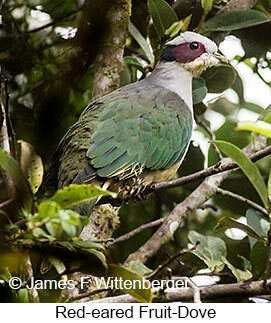 Back at the trailhead we saw Black-naped Fruit-Doves building a nest in a small tree near the parking area. After a box lunch we drove to Toraut, where we spent the afternoon. There we picked up Common Kingfisher along the river. We crossed the river in a bamboo raft and birded trails through the forest. 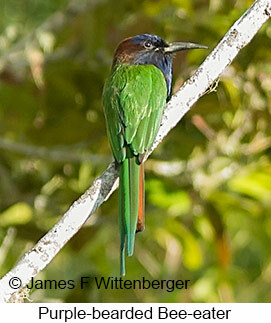 In the forest we ferreted out a Sulawesi Dwarf-Kingfisher buried deep in thick understory. 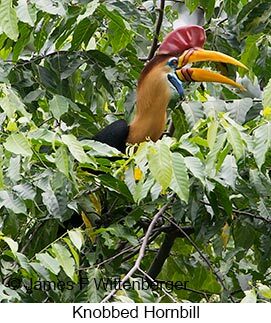 We had superb views of Knobbed Hornbill perched in a tree. We had distant views of Green Imperial-Pigeon and Blue-backed Parrot. We saw a large flock of Yellow-and-green Lorikeets fly overhead and had our first good looks of Silver-tipped Imperial-Pigeons, seen only in flight. We were back at the hotel about 7:30pm after yet another long day. Sep 14: We again left the hotel at 4:00am for the Tambun Maleo Reserve. We went straight into the forest, where we soon found two Maleos perched up in mid-story trees with help from the local ranger. By 5:30 we were getting some light rain, which lasted until 7:00am. While in the reserve we also picked up Sulawesi Serpent-Eagle, Sulawesi Hanging-Parrot, Gray-rumped Treeswift, Collared Kingfisher, and White-rumped Triller. During late morning we did some roadside birding near Tapakolintang. There we saw distant soaring Barred Honey-buzzard, Black Eagle, Rufous-bellied Eagle, and Sulawesi Hawk-Eagle. We also had scope views of an Oriental Hobby and good looks at Ivory-backed Woodswallow and a flock of perched Finch-billed Mynas. After lunch we returned to Toraut. There we saw Pacific Black Duck and Sunda Teal flying along the river. We had good scope views of perched Spotted Harrier, Sulawesi Dwarf-Hornbill, and Pied Cuckooshrike. We left Toraut at 5:30pm and reached the hotel at 7:15pm. Sep 15: We left the hotel at 4:15am, reaching Tapakolintang by 5:30am. We birded there for 5 hours. Early on we had distant views of Sulawesi Myna, and White-necked Myna. 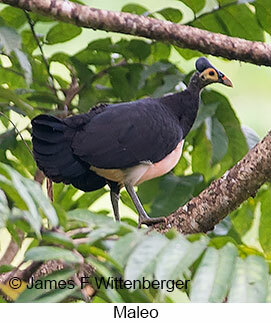 We had prolonged stunning views of male and female Maleo perched in a tree along the road. We had good looks of Knobbed Hornbill, Blue-backed Parrot, Golden-headed Cisticola, and Gray-sided Flowerpecker. We saw two distant Jerdon's Bazas, three Sulawesi Serpent-Eagles soaring overhead, and a soaring Sulawesi Hawk-Eagle. 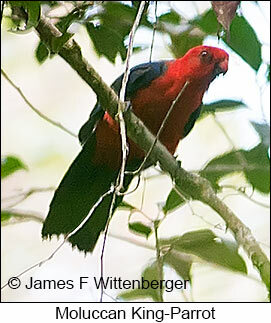 We also saw both Sulawesi Hanging-Parrot and Pygmy Hanging-Parrot. We were back to the hotel by 11:40am for early lunch. At 1:00pm we departed for Manado, stopping at the Amurang rice fields en route. There we had scope views of Greater Painted-Snipe and several waders along with some munias including Black-faced Munia. We reached our hotel in Manado at 5:20pm. Sep 16: We were up at 4:30am for early breakfast before departing for the airport. We took the 6:50am flight from Manado to Kao on Halmahera Island, arriving at 8:45am after an hour flight and an hour time change. We drove toward the Weda Bay Resort, stopping at 12:50pm for a late box lunch along the coast. At the lunch stop we had good looks at Lesser Frigatebird, Sacred Kingfisher, and Beach Kingfisher. We then drove up to a high pass where we spent the afternoon birding along the road. 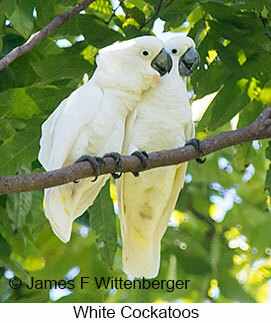 While there we had stunning views of White Cockatoo and White-naped Monarch. We had good looks at Sultan's Cuckoo-Dove, Blue-capped Fruit-Dove, Goliath Coucal, Moluccan Cuckooshrike, Cream-throated White-eye, and Halmahera Flowerpecker. We had good scope views of Gray-headed Fruit-Dove, Cinnamon-bellied Imperial-Pigeon, Red-flanked Lorikeet, Moluccan Hanging-Parrot, Brush Cuckoo, Rufous-bellied Triller, Halmahera Oriole, Moluccan Flycatcher, and Halmahera Golden-Bulbul. After dark we picked up a Moluccan Scops-Owl. We reached the resort at 7:35pm. Sep 17: We departed the hotel at 5:15am for the Standardwing Bird-of-Paradise lek. We reached the forest at 5:55am and the lek at 6:10am. We were in the forest until 11:30am and had numerous stunning views of Standardwing Bird-of-Paradise displaying and even copulating a couple times with females. Most activity was before 6:50am. About 7:00am we began birding along the forest trail. With some effort we had stunning views of Ivory-breasted Pitta perched in the open. In the same spot we had numerous great looks at White Cockatoo and saw a juvenile Moluccan Goshawk on a nest. We had good looks at two Rufous-bellied Trillers overhead and ferreted out a Sombre Kingfisher deep in the forest after bushwhacking off the trail. We returned to the hotel for lunch and early afternoon rest before going out again at 3:00pm. In the afternoon we drove up an old logging road where we found Spangled Drongo. With considerable effort we managed to find Great-billed Parrots perched deep in the forest. 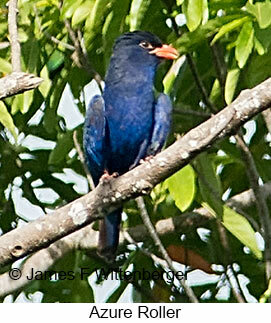 We had very good looks at a prized Azure Roller (also called Purple Dollarbird). This site is one of the few places where it can be found, and few tour groups pick it up. We also saw Spectacled Imperial-Pigeon and Eclectus Parrot. Back at the beginning of the logging road we had brief views of Paradise-crows and good looks of Great Cuckoo-Dove perched and performing display flights. We arrived back at the lodge at 7:00pm. Sep 18: After 4:30am breakfast we began birding at 5:00am. Along the entrance road to the resort we had a great view of Moluccan Owlet-Nightjar. We then returned to the logging road where we spent the rest of the morning. While there we ferreted out a Moluccan Pitta for good looks. We had good views of a stunning Scarlet-breasted Fruit-Dove, Drab Whistler, Spectacled Monarch, and Halmahera Golden-Bulbul. We had distant views of Gray-headed Fruit-Dove, Spectacled Imperial-Pigeon, Cinnamon-bellied Imperial-Pigeon, and Halmahera Cuckooshrike. We also found a rarely seen Ornate Cuscus. That afternoon we birded the loop road up in the foothills. While there we had very good looks at Sultan's Cuckoo-Dove, Blue-and-White Kingfisher and Sombre Kingfisher perched on a wire, and Paradise-crow. After dark we had very good looks at a Halmahera Boobook. We arrived back at the hotel at 7:15pm. Sep 19: We departed at 4:00am for Bukit Hills, a higher elevation site. We arrived there at 6:00am and hiked uphill until 9:15am. Notable birds seen on the way up included Blue-capped Fruit-Dove, Gray-headed Fruit-Dove, Cinnamon-bellied Imperial-Pigeon, Blyth's Hornbill, perched and flying Chattering Lories, perched Violet-necked Lories, Moluccan King-Parrot, Red-cheeked Parrot, Stout-billed Cuckooshrike, Black-chinned Whistler, Rufous Fantail, and Halmahera Leaf Warbler. That afternoon we did some roadside birding and found Black Bittern, Zebra Dove, Moluccan Imperial-Pigeon, Spotted Kestrel, Azure Kingfisher, and Moluccan Starling. Near dusk we managed to get a very quick look of Rufous-tailed Bush-hen after considerable effort. Sep 20: After early breakfast we departed at 5:45am for the logging road we had visited two days previously. We had very good looks at a perched Moluccan Goshawk. We also had very good looks at White-streaked Friarbird. With considerable effort everyone got superb views of our main target bird, Dusky Scrubfowl, lurking about in somewhat open scrub. Back on the road we spent quite a bit of time going after Drab Whistler, which many in the group had missed earlier. We finally got good scope views of it. At a box lunch stop along the coast we picked up Gray-tailed Tattler and Blue-capped Fruit-Dove. We then drove to Tobelo, arriving at 4:30pm. It began raining en route and rained for 3 hours before stopping about 5:00pm. The rain was concerning as our goal that night was Moluccan Scrubfowl, which nests on the nearby beach. The rain might suppress their showing up. We took a small boat out to the mudflats on an island, arriving in the dark at 7:00pm. There we stood/sat for nearly 3 hours while our guide went looking for the scrubfowl. Finally, at 9:45pm he flushed one, which immediately flew off and disappeared. Soon he spotted another one, perched in scrub vegetation, where it froze in the guide's spotlight. We all had good looks of it before we turned off the light. We got back to the hotel about 11:00pm for a short night's sleep. Sep 21: We departed for the airport at 6:00am after "sleeping in" until 5:15am. Our flight departed at 9:10am and arrived at 8:50am thanks to the hour time difference. We then drove to our lodge near Tangkoko National Park, arriving at 11:30am. At 2:30pm we drove to a mangrove area where we spent about an hour on small paddle boats exploring the mangroves. We had terrific views of a perched Great-billed Kingfisher near the boat launch. We also saw Great-billed Heron, Gray-tailed Tattler, Buff-banded Rail, and Common Kingfisher. We spent the last hour and a quarter of the afternoon and early evening birding the main road. We had good views of White-rumped Cuckooshrike and spotlighted a Sulawesi Nightjar. We were back to the lodge at 6:25pm. Sep 22: After early breakfast we left the hotel for Tangkoko National Park at 5:10am, arriving 10min later. We spent all morning birding the access road and trails there. First up were stunning views of Lilac Kingfisher. We then had distant views of Purple-winged Roller perched in a tree along the main track. 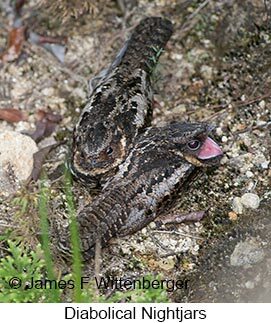 We ferreted out a Sulawesi Nightjar in a day roost well camouflaged on the ground under some bushes. We found a Spot-tailed Goshawk, first seen flying but finally after much effort perched in the open. We had very good looks of Spectral Tarsier hanging out at the entrance to a day roost in a tree hole. Some people had brief looks of Tabon Scrubfowl, which everyone saw the next day. We were able to get good looks at a stunning Rusty-backed Thrush that responded to playback. With the help of the local ranger we found a roosting Ochre-bellied Boobook followed by a prized Minahassa Masked-Owl peering out of a roost hole in a tree. We had brief views of Bay Coucal and Yellow-billed Malkoha, both of which tend to stay hidden in mid-story foliage. We had a good look at Bear Cuscus and found a large troop of habituated Celebes (Sulawesi) Crested Macaques, the latter on the main track. After taking a mid-day break at the lodge, we drove to a viewpoint along the park's access road at 3:30pm. While there we saw numerous Silver-tipped Imperial-Pigeons in the valley below. We also had distant views of White-bellied Imperial-Pigeon, Gray-headed Imperial-Pigeon, Green Imperial-Pigeon, an Eclectus Parrot, and a large flock of Golden-mantled Racquet-tails. Sep 23: We left for Tangkoko National Park at 5:15am and spent the morning there. We had good views of a female Lilac Kingfisher and of Ashy Woodpecker. With help from the local rangers, we had stunning views of Sulawesi Pitta. The rangers' ability to ferret them out was simply extraordinary. 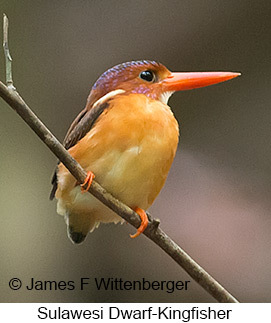 We had scope views of a stunning Great-billed Kingfisher perched in the forest understory. We also had a stunning view of Sulawesi Dwarf-Kingfisher hiding deep in the forest. Everyone had good looks at a pair of Tabon Scrubfowl. The local guide saw Stephan's Dove, which everyone else missed as they were looking at nearby crested macaques at the time. Later most people except me did see Stephan's Dove in a wetland area near the main track. In the same spot most people had decent views of a perched Ruddy Kingfisher. After a mid-day break, we returned to the access road where we saw Gray-headed Imperial-Pigeon, Knobbed Hornbill, Pied Cuckooshrike, White-rumped Triller, and White-necked Myna. Sep 24: After early breakfast we returned to the access road one last time for a couple hours birding. We mainly saw the same species as before. We then went to the parking area at the national park entrance. With some effort we found a Vinous-breasted Sparrowhawk, which kept eluding us but finally perched in the open for good views. We also had brief views of an immature White-bellied Sea-Eagle visible through a gap in the canopy. At 9:00am we were back to the lodge. From there we drove to the airport for flights out of Manado and end of tour.